In the past twenty years, people of all ages have been voting less, they aren’t joining political parties like they used to, volunteering, or involving themselves in the community in other ways as they have historically. At the same time, there has been incredible growth in the adoption of digital devices and technologies, which has created new opportunities for participation and communication between citizens and governments. The Centre for e-Democracy is the result of a collaboration between Delvinia CEO Adam Froman and Nicole Goodman, an Assistant Professor at the University of Toronto’s Munk School of Global Affairs. The pair have worked together on several e-Democracy initiatives dating back to 2010 and saw an opportunity to create the Centre by building upon their earlier work around the Voice of e-Democracy; an online panel of citizens powered by Delvinia’s AskingCanadians online research platform. The first of its kind in Canada, the Centre will be a hot spot for e-democracy research with hopes of making a real, practical impact on our knowledge and understanding of the use of technology in society and politics. Topics like Internet voting, open government and intelligent communities will all be a focus of the Centre’s knowledge building activities. We will release mini-reports on these topics of interest. These reports will be freely available on the Centre’s website and will be written in clear, plain language that is easy to understand. You won’t need to pay a membership fee to gain access, and you won’t need a dictionary or Google to translate and understand our findings. It is our hope the Centre will provide access to scholarly and balanced academic research in order that those seeking knowledge on these topics can be better informed on the ways technology is changing opportunities for political participation, government services, and policy. By initiating, translating and disseminating research and knowledge on the impact of digital technologies on politics and democracy, we hope to foster more informed citizens and governments. Adam is an award-winning entrepreneur and business leader in interactive communications and marketing. He is a big believer in the transformative power of digital technologies. He is driven to understand how Canadians are integrating technology into their lives and how brands can adapt by creating relevant digital experiences. As the founder and CEO of Delvinia, he believes digital platforms can be used to create meaningful, human connections between companies and their customers and it is this philosophy that he has applied to his organization. Adam established Delvinia, a Toronto-based digital strategy and customer experience design firm, in 1998. The company helps its clients respond to the opportunities and challenges that digital technologies bring to customer relationships. He is also the founder of AskingCanadians, an online data collection business with access to a research community of more than 600,000 Canadians. Adam’s association memberships include the Canadian Marketing Association, Esomar and the Marketing Research and Intelligence Association, where he is a director of the MRIA’s Research Agency Council. Adam is also a Professional Engineer in the discipline of Human Factors Engineering and has an MBA from the Schulich School of Business. Dr. David A. Wolfe is Professor of Political Science at UTM and Co-Director of the Innovation Policy Lab at the Munk School of Global Affairs. From 2009 to 2014 he was the Royal Bank Chair in Public and Economic Policy at the University of Toronto. He has been the Principal Investigator on two Major Collaborative Research Initiatives funded by the Social Sciences and Humanities Research Council of Canada, the first on Innovation Systems and Economic Development: The Role of Local and Regional Clusters in Canada and the second on Social Dynamics of Economic Performance: Innovation and Creativity in City-Regions. He has just been awarded a major new SSHRC Partnership Grant on Creating Digital Opportunity: Canada’s ICT Industry in Global Perspective that runs from 2014 to 2020.Wolfe has published extensively on cluster dynamics and related knowledge-based economic development. He was also the CIBC Scholar-in-Residence at the Conference Board of Canada in 2008-2009 and published 21st Century Cities in Canada: The Geography of Innovation in that capacity. In addition, he is the editor or co-editor of ten books and numerous scholarly articles. His most recent book is Innovating in Urban Economies: Economic Transformation in Canadian City-RegionsWolfe holds a BA and MA in political science from Carleton University, and a PhD from the University of Toronto. Nicole Goodman, PhD, is the Director of the Centre for e-Democracy and has a concurrent appointment at the University of Toronto’s Munk School of Global Affairs. Her current research examines the effect of digital technology on political institutions and actors as it relates to participation and governance. Most of this work is focused at the community level – in municipalities and Indigenous communities. She has also explored public policy, voter behaviour, Indigenous self-determination and innovation. Nicole recently led a Social Sciences and Humanities Research Council (SSHRC) funded study of the 2014 Ontario municipal elections to assess the effects of internet voting on voters and election administration in 47 municipalities – the largest attitudinal study carried out on internet voting to date. She is currently part of two multi-year SSHRC-funded research projects that are based on extensive industry, government and community partnerships to understand the impact of digital technology on Canadian cities and Indigenous communities. Findings from these projects will allow us to learn about the effects of technology on voting behaviour, citizen participation, Indigenous self-determination, changes in the efficiency and quality of government service delivery and governance more broadly. Nicole has authored multiple academic papers and government reports and is regularly called upon by governments and organizations in Canada and internationally for her expertise related to voting technologies. 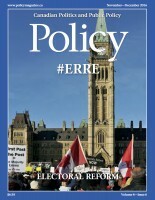 Findings from her recent research have been presented in testimony to the Standing Committee on the Legislative Assembly (Ontario) and the Special Committee on Electoral Reform and have been featured in The Globe and Mail, Ottawa Citizen, Toronto Star, CBC and on TVO as well as other outlets.